UPDATE: The Scratch team has now fixed this bug. My book How to Code includes a buzzer game project. 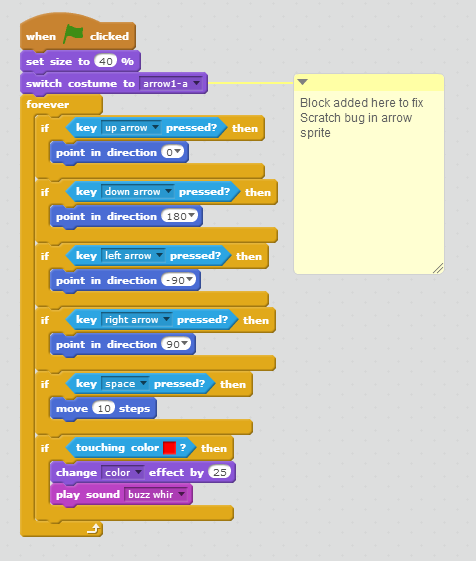 There's a bug in Scratch at the moment, which means the arrow sprite doesn't face the direction of travel. When you add a sprite, its default movement direction is right, so sprites are usually drawn to be facing right. The arrow1 sprite, however, points up when it is loaded. This is a new thing, because it wasn't the case when I wrote and tested the game and it isn't the case in my downloaded version of Scratch 2.0, which is older than the current online version. If you are experiencing this problem, you can fix it by adding a block to set the costume to the correct one at the start of the game, as shown below.